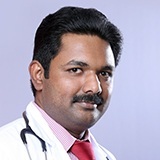 Dr. Jaise Jacob has obtained his Bachelor of Medicine and Bachelor of Surgery (MBBS) from the Academy of Medical Sciences, Pariyaram, Kannur. He later obtained his Diploma in Otorhinolaryngology (DLO) from the St. John’s Medical College, Bangalore, India. Dr. Jaise has over 5 years of experience in the medical field. He started his professional journey as a Medical Officer in the ENT department at the Medical Trust Hospital, Kayamkulam, Kerala, India. He gained 3 years of experience there before joining St. John’s Medical College in Bangalore, India as a Post-graduate Resident in department of ENT and Head and Neck Surgery. Then, prior to joining NMC Healthcare, Dr. Jaise was the Assistant Surgeon at the Government Hospital in Kayamkulam, Kerala, India. Dr. Jaise has attended many workshops and CME’s since 2011. Dr. Jaise is fluent in English, Kannada, Malayalam, Tamil and Hindi.